After the upward move from $82 (December 17) to $165 (January 3) price is in the process of retracing and is currently at the 0.786 fib line. The retracement is currently on day 33, almost twice as long as it took for the upward move to materialize (19 days). Price is trading in a short-term descending channel and has made four unsuccessful attempts at breaking through the channels’ resistance. A look at the Daily chart for Ethereum shows that price is currently trading at $106. After the upward move from $83 to $165 price has retraced all the way back to the 0.786 fib level. The price started the retrace after facing resistance from the 50-period moving average and the Ichimoku cloud. It is currently trading below the 7, 21, 50,200 period MAs. Furthermore, the 7 and 21 period MAs have made a bearish cross and price is facing very close resistance from the 7-period MA. 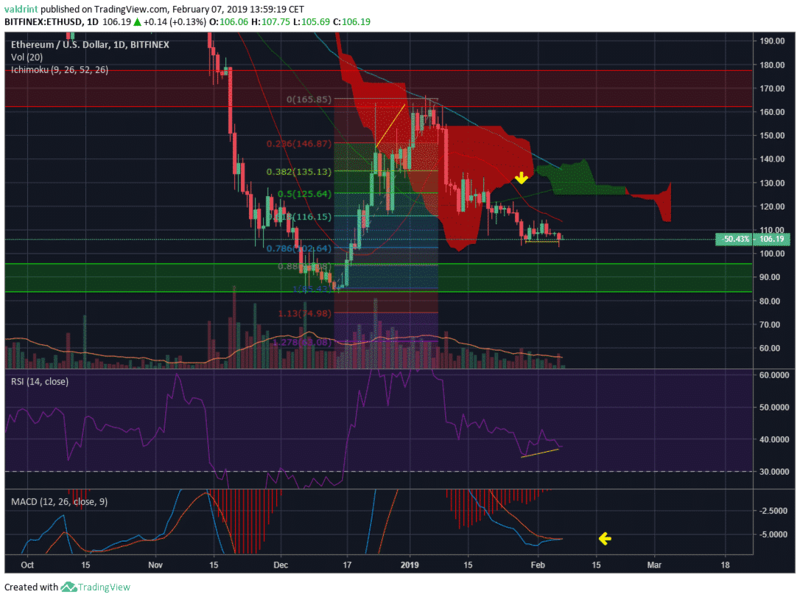 However, there is a large portion of the cloud which is positive, possibly allowing price to breakout and there is significant bullish divergence that has been occurring in the RSI for the past 8 days. Finally the MACD is very close to making a bullish cross. A look at the 4-hour chart gives us a structure in which price is trading in and provides us with minor and major support and resistance areas. Price is currently trading in a downward channel and has been doing so since January 14th. The resistance line of the channel has been validated by four unsuccessful attempts at breaking out, while the support line has been validated by three successful price bounces. We are currently on day 23 of the downward channel. Furthermore, after two unsuccessful attempts at moving past the minor resistance area near $111, the price has retraced to the minor support area at $104-$106. Price is facing very close resistance from the 7 and 21 period MAs which have made a bearish cross. 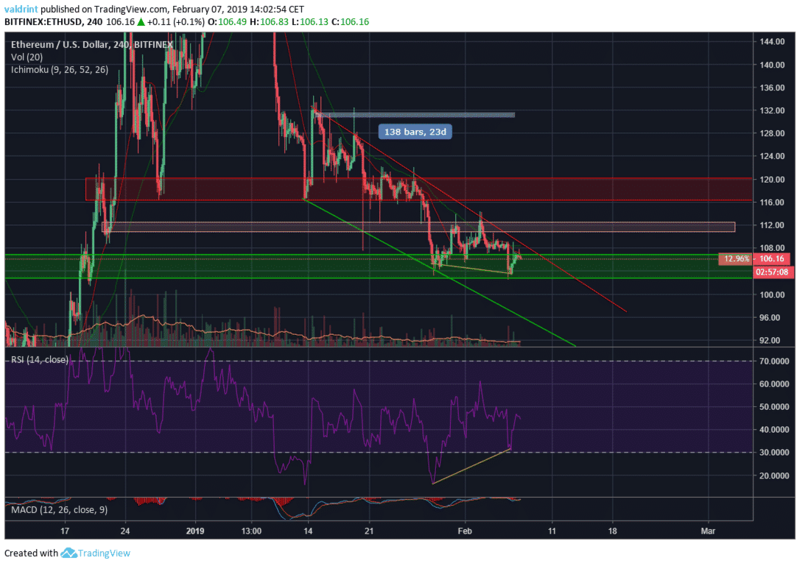 However, there is very significant bullish divergence occurring in the RSI, which has moved outside of oversold territory and is currently at 42. A break below the support of the downward channel could set in motion a sharper drop to the major support area at $82-$90.